Chickens are very difficult models. I must have about 4,000 chicken photos. 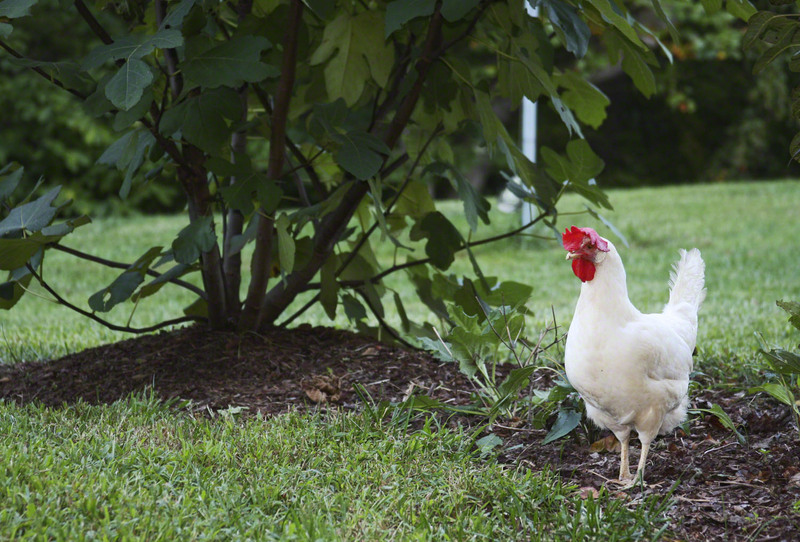 In 3,990 of them the chicken is facing the wrong way, running the wrong way or taking a poop. To photograph a chicken takes patience and Olympic-class squatting ability. You must get down…wayyyyy down…into a squat position and stay there for about four hours while training your camera on the chicken and waiting for him or her to gaze in your direction. 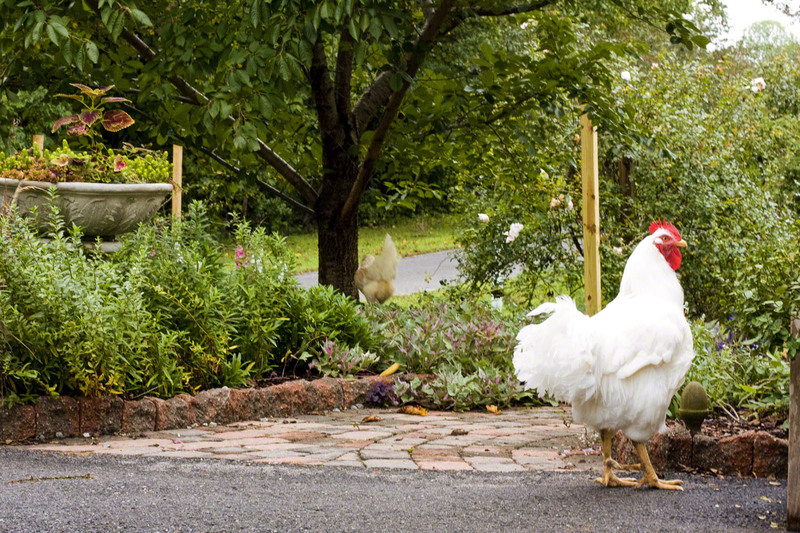 If you try and rush said gaze by, say, whistling, you will alarm the chicken into facing the wrong way, running the wrong way or taking a poop. So the following represents about three weeks of squatting and waiting patiently. Enjoy. I have to go rub some Bengay on my quads now. Worth the squatting for me anyway. Is that T. Boone? He is handsome. Well they turned out really lovely! Congratulaions! On behalf of CAAPOA (Chicken Admirers and Photographers of America) you now qualify for the coveted “Golden Knees” award for artistic merit. Good job! The chickens are as photogenic as ever. That’s some mighty fine sweet potato vine you have there, too. Very beautiful photos and chickens, Robin! Worth the sore quads. 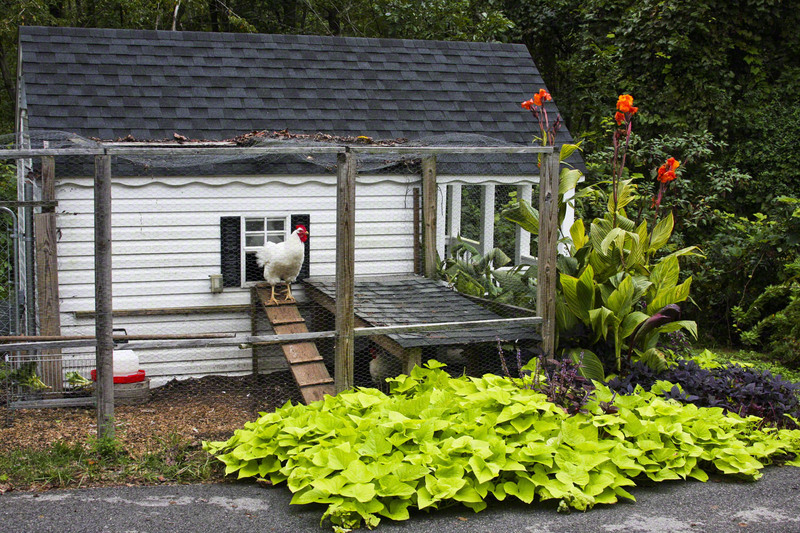 I love the hen house shot with the sweet potato vine. Nothing improves the soil like chicken manure. Thanks for the chuckle! I love your chicken house–too cute! 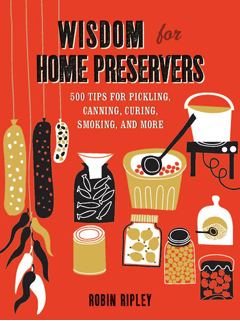 Carol – Chickens poop a LOT. I would guess each chicken poops 20-30 times/day. You can’t raise chickens and be too prissy. 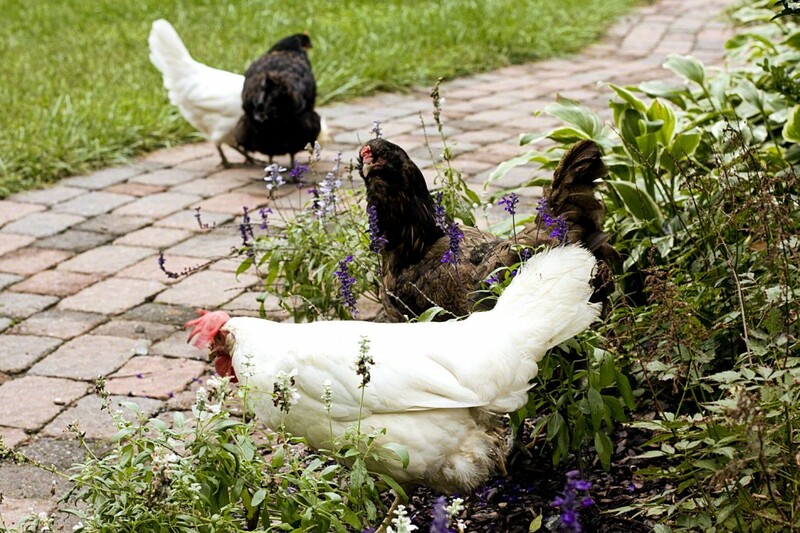 I literally LOL’d at the pictures of the chickens in your garden! My neighbors used to have chickens, ducks, a turkey, among other farm animals…until someone called and complained about the suburbs not being farm friendly. 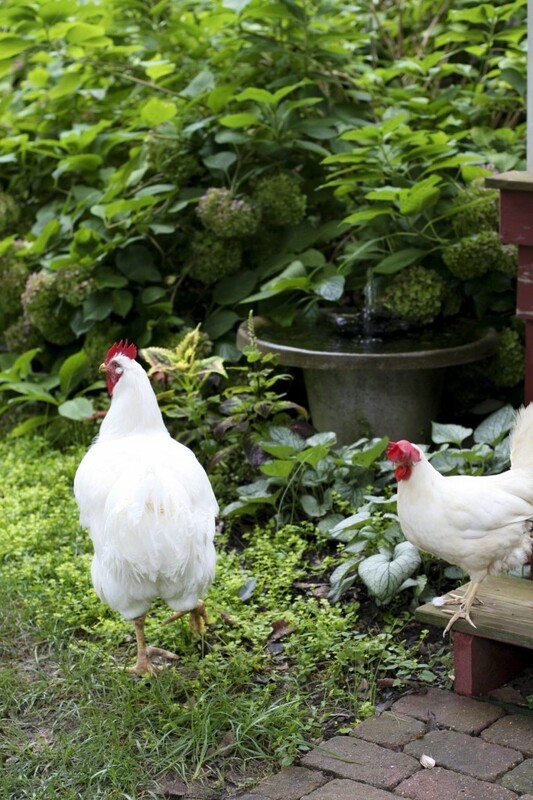 How does having chickens help your garden? Is it kind of like natural manure? 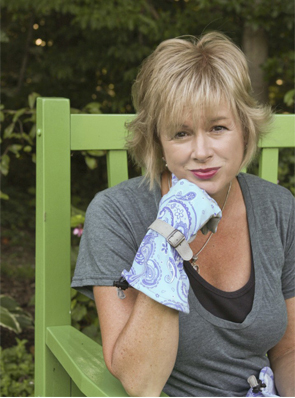 My family has been home-gardening for over 30 years, so I’m interested! I keep trying to get mine to respond to the word “freeze” but it isn’t working. Well I can say I never thought much about taking a picture of a chicken but I can see your point. They look good. Found you somehow on Twitter and, well, love your pix and your words! First of all, I NEED you to post more about your chicken family. I love reading about all of their adventures. Second, how in the world do you have such beautiful hostas around your chicken coop? My 3 girls have completely destoryed ours to the roots. This is certainly one spoilt chicken, a lovely chicken house. I think these pictures are really good! What beautiful chickens. I leave the photography to my son, or there would be no pictures on my blog. Well done for getting the ones in your blog. The chickens look pretty neat too, by the way. or taking a poop! classic. Reading this makes me miss my chickens so much. Wish I could have them where I’m at. So much fun to read today and I love the photos! Especially the hen house shot.